OEJ, have you thought about the fly from one of those really light camping hammocks? I (if I make it there) will likely be in class 4 with my Lightning and I have been eyeing up those hammocks for multipurposing. If you, or yours, are handy you could make ur own with ripstop nylon... and color-coordinate it with your hull..or... make it look like sand for really stealth camping. Maybe its all in my head, but I think a tarp (poly-type) might not breathe much or tend to trap moisture..... okay now that I wrote that down, it kinda does sound more like it might be all in my head, but hey, I've read a lot on this site that says the mental aspect is a big (or the biggest) part of the event! JVG, the tarp is not really a problem. How to suspend it given the limitations of a kayak. Here in FL in the summer you don't really want to camp in the mangroves. Swamp Angels will carry you off. OEJ, all I can say is "Umbrella"! Have you see what Kruger does for their canoes? Looking for shade ideas for camping, not while paddling. OEJ, sounds like a material issues, look at some very light nylon coupled with some small tent poles. This might be a interesting project! I have a few old spinakers stuffed in bags somewhere. Advantages of parabolic tarps are that they setup very taught (don't flap in the wind), and need only two anchor points (can be a challenge in sugar sand). Disadvantage is that they aren't as flexible a shape if you want to use the tarp for other things/situations. Most freestanding tents (such as a Hubba) also just let you setup just the poles and fly. This gives shade, but they fit close to the ground so don't provide much ventilation and tend to bake you unless there is a good breeze. I like that parabolic tarp idea. Tension would be a problem. Could use my GP paddles as uprights. OEJ, the stetup KV just posted was exactly what I had meant by using the hammock fly (rain/condensate cover?) for a tarp and using the paddles where the poles stand. 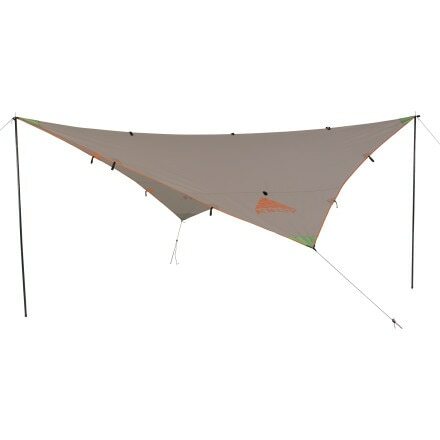 I recently saw a video of a guy who sets his hammock "without poles" - was kinda disappointed cuz it turned out to be that he only put his hammock on the ground and stretched the parabolic tarp above him using some rigid, elongated pieces that may or may not have been called "poles". Oh, but he was proud of his innovation! I've used a "beach" umbrella for the past couple years--easy to set up & change. This picture was taken at Hog Key. 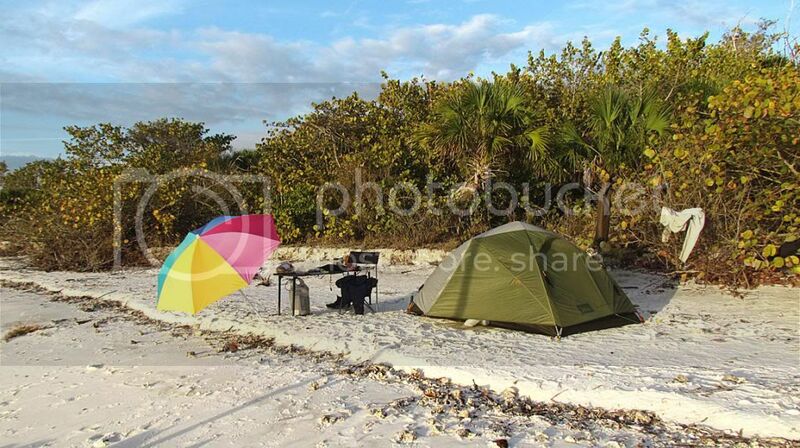 I use a Hobie Adventure Island and store the umbrella on the outside. Umbrellas like this fit plastic sand augers.